If your thyroid isn’t working properly, neither are you! More than 20 million Americans suffer from thyroid disorders. It’s more common than diabetes and heart disease, but an estimated 60 percent of cases go undiagnosed. Signs of an underactive thyroid gland, or hypothyroidism, include puffy eyes or gradual forgetfulness, a dull facial expression and changes in hair (sparse, coarse, dry) and skin (coarse, dry, scaly). Symptoms of an overactive thyroid gland, or hyperthyroidism, are goiter (enlargement of the thyroid gland), bulging eyeballs, fast heart rate, moist skin, frequent bowel movements, tremor, jumpiness, sensitivity to heat, and insomnia. Lumps in the thyroid gland may appear gradually or very rapidly, and can either be benign or malignant. All thyroid "lumps" (nodules) should generate suspicion and a prompt visit to the doctor. 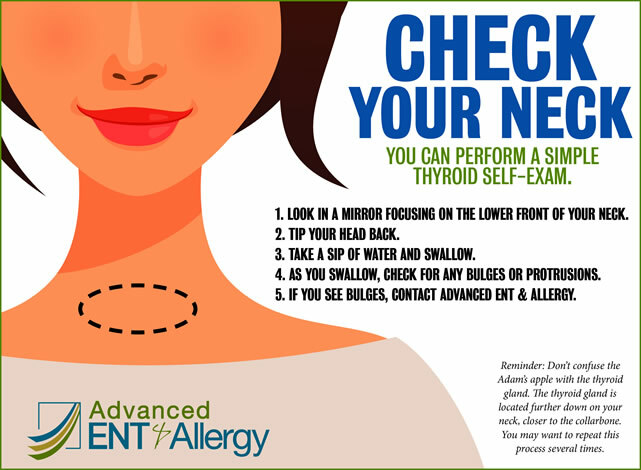 If you feel like you have an enlarged thyroid lump, please visit Advanced ENT & Allergy at www.AdvancedENTandAllergy.com or call (502) 995-5525 to schedule an appointment.